Waterfall visits can be safe excursions for the whole family. If you take some simple precautions and use common sense, the risk of harming yourself at Ontario's waterfalls is very low. But you should know what to look out for. This is why there is a waterfall here! Some waterfalls developed as tourist sites will have fences and viewing platforms. But many others have nothing. So you must stay back from the edge. 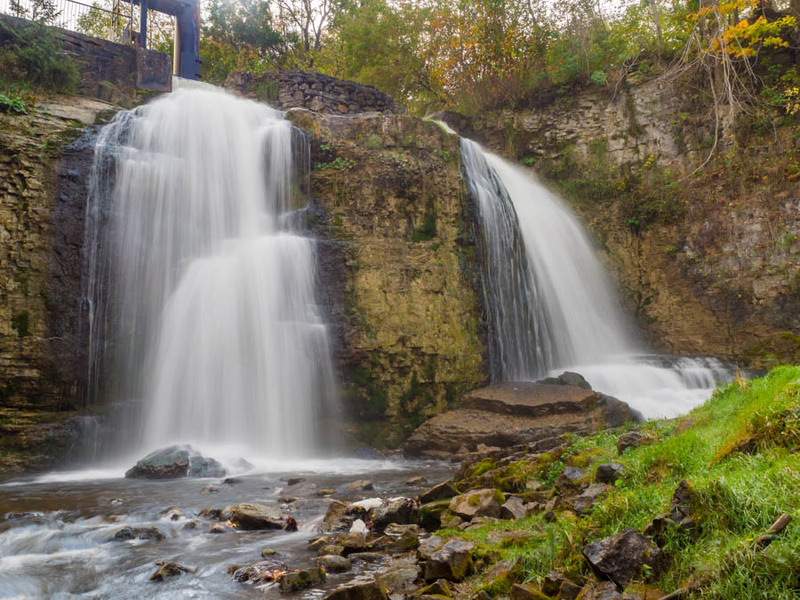 People have fallen to their death at Ontario's waterfalls. There is always a river or stream involved at a waterfall. These range from little babbling brooks to raging (seriously) rivers. Currents can overcome even the strongest swimmer, so please stay back from the water's edge. People have drowned at Ontario's waterfalls. Most of the waterfalls in this guide are located near a road (especially anything with green stars). But some are found in less populated parts of the province and you may be the only visitor that day! Also, cell phones don't always work when you are the bottom of a narrow rocky gorge. Please plan ahead, especially you are going to more remote areas. Consider letting someone know where you will be - why not send them a link to this web site! Once you get out of southern Ontario, you are in bear territory. 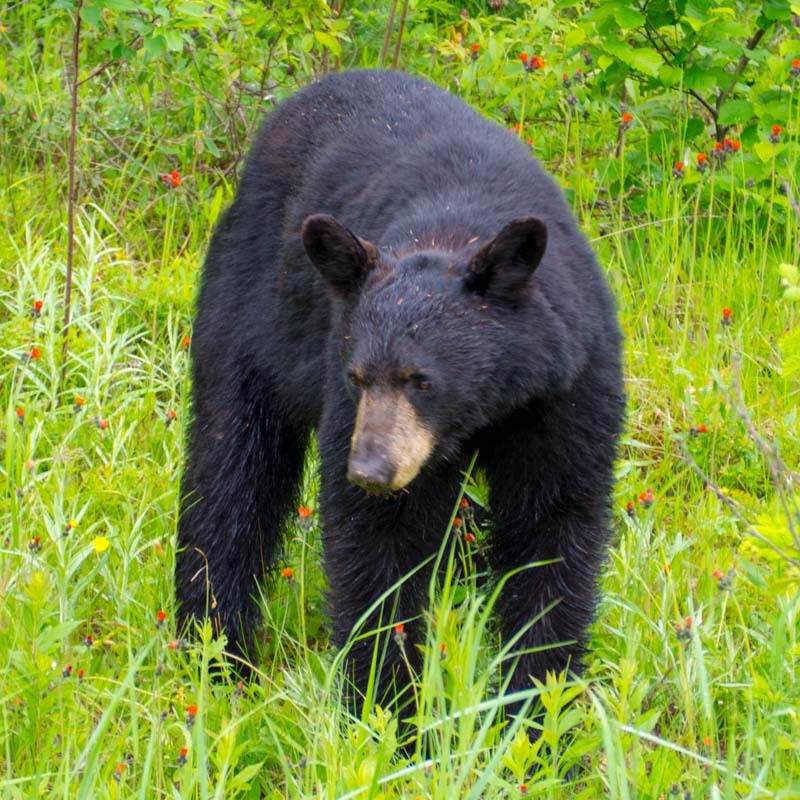 In recent years, this territory has been pushing south, with sightings as far south as London and Lambton County. In all my years of waterfalling, I have never come across a bear in the woods. Remember, the chances of even seeing one is very slim, and even if this happens, they are likely to run off in the other direction. Still, if you plan to visit waterfalls in northern Ontario or remote areas of central Ontario, please take a few minutes to become Bear Wise. The one and only time that I came close to a bear was driving along Hwy 144 west of Timmins. This guy had crossed the road and then posed for my zoom lens. That's close enough for me, and he was a little guy! We are fortunate to have just one poisonous snake in Ontario - the Eastern Massasauga Rattlesnake. These are isolated to such a small part of the province, you are very, very, very unlikely to come across one on your travels. You may encounter poison ivy in the woods. Remember, 'Leaves of three, let it be.' Learn how to identify it. The itch-causing oil is transferred by contact, so if you stay on the trail, you are unlikely to ever run into it. Something else that is on the rise in southern Ontario is an invasive plant called Giant Hogweed. This looks like 'Queen Anne's Lace on steroids', as it grows to 5 m in height. Contact with the clear watery sap can cause severe rash and scars that last for years. Learn to stay away! Another thing that is becoming more of a concern in Ontario is the reent spread of Lyme Disease through ticks. Not all ticks carry Lyme Disease, but please know what to do if you are bitten. We are lucky that most of the waterfalls in Ontario are on public lands. But there are a few that are located on private property. Some landowners have been fending off trespassers for years and may have run out of patience. NOTE: This page does not and will never knowingly list any waterfalls that are on private land. But I take no responsibilty for being 100% correct, and land ownership can change. If in doubt, please ask someone for clarification. In summary, take precautions and you will be safe. As a grim reminder of the risks though, I have kept a list of the waterfalls at which people have lost their lives. Mark Harris hereby notifies you that he takes no responsiblity for your safety. Inclusion of waterfall in this guide does not guarantee that it is safe and/or legal to visit. We are lucky in Ontario that most waterfalls are located on public lands. Still, there are a few that can only be accessed by private property. These should be avoided unless you can obtain permission from the landowner. Many landowners will grant this if you ask nicely. I avoid them altogether though, as there are hundreds more to explore. No matter what excuse or justification you think you have in your head, there is no 'law' or 'natural right' that allows you to cross someone's property to access a river. It doesn't matter what someone else tells you or what you believe. If you cross private property, you are trespassing. Sorry. This web page does not knowingly include directions to waterfalls that are on private property. If you see an error, or know of a site that should be removed due to privacy concerns, please contact me. Unfortunately, I don't think that there is a law that says that private property has to be fenced or signed. Please heed any signs that you see, and use your common sense. We have hundreds of waterfalls to visit, so just move on to a public one. Some government (and Google) maps still identify privately owned waterfalls. They are natural features afterall. But to help to spread the word, here is a list of waterfalls that can only be accessed by private property. 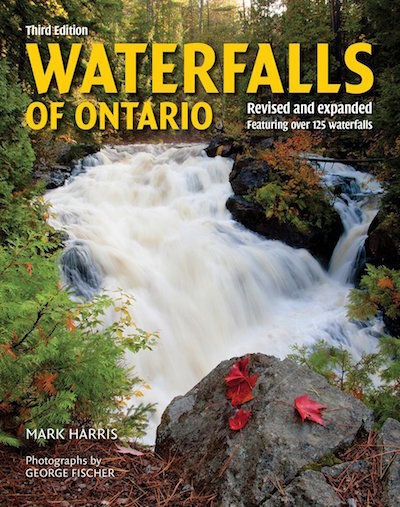 Mark Harris hereby notifies you that the inclusion of waterfall in this guide does not guarantee that it is safe and/or legal to visit. He takes no responsibilty for your access of any private lands. You are responsible for your own decisions. This web site relies on driving directions provided by Google Maps. For the most part, these are accurate. However, once you get to the waterfall there is always the risk of getting lost. Please pay attention to your surroundings, and be sure to remember how to get back to your car! Most of the best waterfalls are only a few minutes' hike from a parking location. Most of the sites of moderate interest are actually fairly easy to get to. It's mainly only some of the yellow- and red-star sites where you are at risk. Some of my directions may be 15 years old. I don't visit all of these waterfalls every year! So it's possible that a road or trail has been closed, or that there is some other reason why you can't access the falls. I take no responsiblity for this - this site is only a guide. Finally, please be careful on the roads!